As of December 31, 2018 - The Wildside Trail has sustained major windfall damage due to last week’s storm and the trail is impassable. This area will remain closed until appropriate assessments determine that it is safe to reopen this area to the public. Flores Island is one of the most popular destinations in Clayoquot Sound. Here, visitors can enjoy hiking, whale watching, fishing, kayaking, beach camping and more. This vast, untamed wilderness area protects undisturbed watersheds with old-growth forest stands of Sitka spruce, as well as representative coastal and marine ecosystems, including excellent spawning conditions for coho salmon, exposed rocky coasts, sandstone reefs, beaches, sheltered channels and bays, fast narrows, mudflats and shallow banks. One of the main attractions of Flores Island is the “Walk the Wild Side Trail,” a route that extends 10 km from the village of Ahousat to Cow Bay. First Nation peoples have used this route for centuries to reach the wild beaches on the west side of the island, and this vital circuit can now be explored by park visitors. Most of the route follows sandy beaches, and trails cut across headlands to join with the next beach. Muddy and slippery sections are present on this route, at this time. The park offers excellent opportunities to see Gray whales, who pass by the Island in their annual migration from Baja California to Alaska. Seasonally resident Gray whales also use the bays for feeding during the summer. Visitors come from around the world to see the whales and kayak the waters in Clayoquot Sound, and a trip to the area would not be complete without discovering all that beautiful Flores Island has to offer. Please do your part when recreating in wolf country and help to keep wolves wild. Please avoid wolf encounters and practice proper backcountry etiquette. Hiking to Mt. Flores is not recommended – the old route to Mt. Flores is not marked, very rough, and is difficult to locate. There are currently no BC Parks fees to camp within Flores Island Provincial Park. For more information or to purchase permits to hike the Walk the Wildside Trail, please contact the administration office at info@wildsidetrail.com or call 1 250 670-6803. Flores Island is located in the central portion of Clayoquot Sound, north of Tofino on the West Coast of Vancouver Island. This park includes the western and southern parts of Flores Island, and is accessible only by boat from Tofino. Boaters can reference marine chart #3674 and #3673 for more information on this area. Water taxis from Tofino and Hot Springs Village offeraccess to the park via the Village of Ahousaht. Nearby communities include: Tofino, Ahousat and Hotsprings Village. Cultural Heritage: The park lies in the traditional territory of the Ahoushat First Nations. Flores Island Park contains many Nuu-chah-nulth First Nations heritage sites, including middens and Culturally Modified Trees (CMTs). Conservation: The park protects undisturbed watersheds with old-growth forest stands of Sitka spruce as well as representative coastal and marine ecosystems, including excellent spawning conditions for coho salmon, exposed rocky coasts, sandstone reefs, beaches, sheltered channels and bays, fast narrows, mudflats and shallow banks. Gray whales migrate through the off-shore waters and seasonally resident Gray whales use the bays for feeding during the summer. People come from around the world to kayak and camp in remote Clayoquot Sound and enjoy the sandy beaches, scenery and wildlife. The beaches of Flores Island are a very popular kayaking/camping spot. 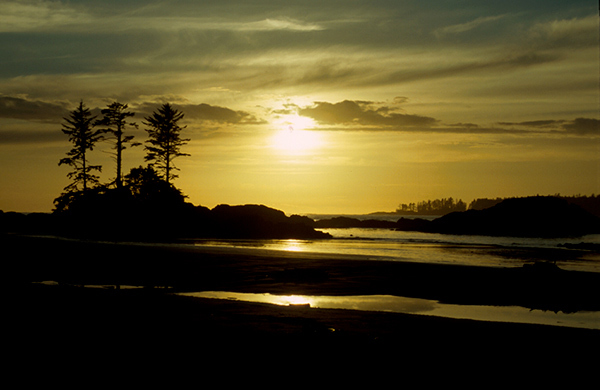 International and local eco-tourism companies offer trips into this area, and kayak rentals are available in Tofino. Canoeing is not recommended. This park has a trail called the “Walk the Wild Side” trail. This route extends 10 km from Ahousat to Cow Bay; most of the route follows sandy beaches. Trails cut across headlands to join with the next beach. At this time, muddy and slippery sections are present on this route. The trail is best accessed from the village of Ahousaht. Water taxis to Ahousaht generally depart from the 1st Street dock in Tofino. For your own safety and the preservation of the park, obey posted signs and keep to designated trails. Shortcutting trails destroys plant life and soil structure. Please note: Hiking to Mt. Flores is not recommended – the old route to Mt. Flores is not marked, very rough, and difficult to locate. Pets/domestic animals must be on a leash at all times and are not allowed in beach areas or park buildings. You are responsible for their behaviour and must dispose of their excrement. Backcountry areas are not suitable for dogs or other pets due to wildlife issues and the potential for problems with wolves, bears and cougars. There is no designated swimming area in this park, however opportunities exist for swimming on the park’s sandy beaches. There are no lifeguards on duty in this park. Gray whales can be encountered at any time during the summer, particularly in Cow Bay. This park also offers opportunities to view seals, sea lions, Bald eagles and a variety of seabirds. Note: Please abide to current Department of Fisheries and Oceans (DFO) Marine Viewing Guidelines when viewing marine wildlife in BC Parks. While small fires are allowed, we encourage visitors to conserve the environment by minimizing the use of fire and using stoves instead. If you do have a fire please use small pieces of wood that will burn completely and keep the fire below the high tide mark. Never build your fire near the beach log piles as the fire could ignite the logs and get out of control; also do not leave your fire unattended and practice “Leave No Trace”. One pit toilet is located at the Cow Bay end of the park. There are no designated campsites at this park, however random wilderness camping is allowed. No facilities other than a pit toilet are provided. Please practice “Leave No Trace” camping ethics. Flores Island is accessible year-round; there is no winter camping fee at this time. Flores Island is accessible year-round; there is no winter camping fee at this time.